February Job Numbers: Evidence for a Growth Trend or Just One More Outlier in an Era of Employment Volatility and Too Little Growth? Source: Employment Situation Summary Table B. 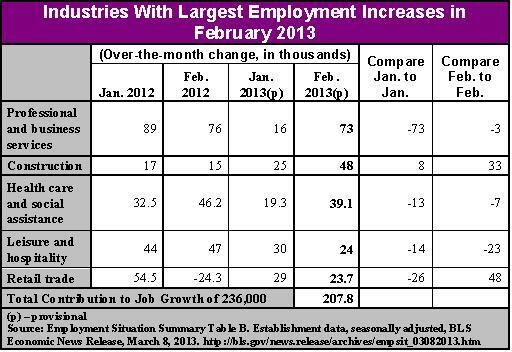 Establishment data, seasonally adjusted, Bureau of Labor Statistics Economic News Release, March 8, 2013. Source: Employment Situation Summary Table B. Establishment data,seasonally adjusted, Bureau of Labor Statistics Economic News Release, March 8, 2013. Agustino Fontevecchia, Despite $50B In Damages, Hurricane Sandy Will Be Good For The Economy, Goldman Says, Forbes, 11/06/2012. 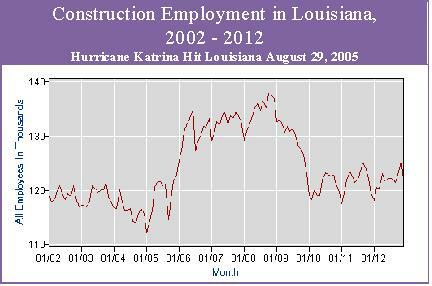 Chart generated by BLS State and Area Employment web site. The largest global disasters of 2012 were Hurricane Sandy (with a cost of $65 billion) and the year-long Midwest/Plains drought ($35 billion), according to the company’s Annual Global Climate and Catastrophe Report, which was prepared by Aon Benfield’s Impact Forecasting division. Doyle Rice, Hurricane Sandy, drought cost U.S. $100 billion, USA TODAY, January 25, 2013. Joel Naroff of Naroff Economic Advisors … expects average monthly job gains of 200,000-plus this year if the White House and Congress can agree to put off the budget cuts. If all the reductions occur, it likely would mean monthly gains of about 165,000, he says. Paul Davidson, Employers add a stunning 236,000 jobs in Feb., USA TODAY, March 8, 2013. Stronger than usual February job growth is widely hailed as part of an economic recovery in the U.S. that many are seeing in recent positive market signals – rising housing prices and a flourishing stock market, for examples. The explicit expectation is that we will not look back a year from now and see February’s 236,000 added jobs as only an outlier in year of mostly disappointing employment news. It is possible that job growth will be strong this year, but it is unlikely. Several factors involved in the production of February’s job growth numbers suggest that job growth numbers will bounce up and down in 2013 as they have in the past and leave the U.S with unemployment, underemployment, and labor force participation rates much as they are today. The first indicator that we should not put much stock in February job growth numbers is that job growth numbers for January and February 2012 were considerably better than the numbers for January and February 2013. Yet 2012 ended with little progress toward getting Americans back to work. Both the Midwest/Plains drought and Hurricane Sandy damaged industries and destroyed property. Smaller weather events, such as severe winter storms, have also done damage. some professional and business services, such as legal, architectural, engineering, document preparation and clerical, security and surveillance, cleaning, and waste disposal services, are part of recovery efforts related to Hurricane Sandy. 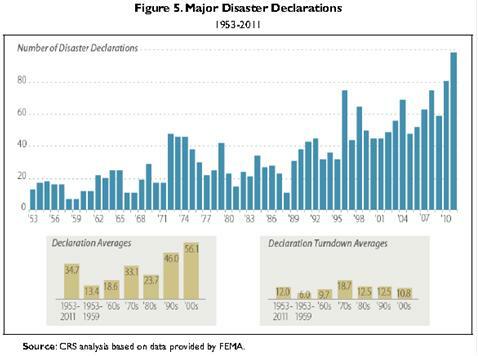 Employment related to Hurricane Sandy and winter storms will fall off as the year progresses. Of course, other disasters and damaging weather events will strike. But, when and where those events strike and how much demand for goods and services they will generate can’t be known. It is fairly certain, though, that the impact of large and small natural disasters on employment will grow larger over the coming years, adding more volatility to month to month job growth numbers. Although jobs in health care and social services are listed in the private sector, many of those jobs are paid for by grants and contracts from local, state, and federal government agencies. The same is true for employment in most educational institutions and in many manufacturing business service industries that supply goods to government agencies. Given the volatile political tugs-of-war over revenue and spending policies at all levels of government, jobs in industries with federal funding can come and go quickly. Perhaps some of this effect is in the February job numbers. It is good to have job growth, but it is certainly less than optimal if a growing proportion of new jobs are associated with repairing and replacing the damaged wealth of those who already have it rather than creating new wealth to be shared with the very large number of Americans who have no net wealth at all. Climate change and government gridlock are robbing both those of us with wealth and those of us without it. Posted on March 10, 2013 by Jim LundayPosted in Climate Change, Global Workforce Trends, U.S. Workforce TrendsTagged Employment, Employment Trends, Employment Volatility, Job Growth, Private Sector.